TS Polycet Counselling Dates 2018: Telangana Polycet 2018 Counselling Notification, Rank Wise Schedule, certificates required, processing fee, tuition fee, exercising options and seat allotment details are available at tspolycet.nic.in. Telangana Polycet 2018 Web based Counselling Notification: The Qualified candidates of TSPOLYCET-2018 desirous of seeking admission into Diploma Courses in Polytechnics of Telangana State are informed that the payment of Processing Fee, Certificate Verification and Option Exercise will commence as per the schedule given below. For details of procedure to be followed and other relevant information please read instructions to the candidate placed in the website https://tspolycet.nic.in. Candidates are informed to collect the details of procedure to be followed and other relevant information from Help Line Centres on the day of Certificate Verification without fail and the same is also placed on website: https://tspolycet.nic.in. CBSE / ICSE – 2018 appeared candidates awaiting for results subject to the condition that the candidates should have passed the examination on declaration of results. Candidates should have passed S.S.C. Examination conducted by State Board of Secondary Education, Telangana / Andhra Pradesh or any other examination recognized as equivalent there to by the Board of Secondary Education, TS/ AP such as Central Board of Secondary Education (CBSE), Indian Council for Secondary Education (ICSE), National Institute of Open School (NIOS), Telangana Open School Society (TOSS), A.P. Open School Society (APOSS), X class examination conducted by various State Boards of Secondary Education in India with Mathematics as one of the subjects and obtained at least 35% marks in the qualifying examination. Candidates belonging to NIOS/TOSS/APOSS/CBSE/ICSE/Other Examinations recognized as equivalent to SSC by Telangana State should have passed all the subjects including Mathematics, Physics, Chemistry, with minimum of 35% Marks in each subject. There is no age restriction for seeking admission into Diploma Courses in Polytechnics. However maximum eligible age for obtaining a scholarship is 20 years for OC candidates and 24 years for other candidates as on the date of 01-07-2018 as per the guidelines prescribed in Memo No. 10537/SW(Edn.2)/2011, dated: 20-10-2012 and further guidelines issued from time to time by Social Welfare (Edn.) Department shall apply. Mere appearing for TSPOLYCET-2018 and obtaining a rank does not entitle a candidate to be considered for admission automatically unless the candidate fulfils the requirements laid down for admissions. > ICR Number given on TSPOLYCET-2018 Hall Ticket. > Date of Birth as mentioned in the SSC Marks Memo. > SSC Hall Ticket Number. PH – (V) – Visually Handicapped. PH – (H) – Hearing impaired Handicapped. S & G – Sports & Games. NCC & Sports and Games- Certificates issued by competent authorities. Read the Instructions to candidates placed in the website https://tspolycet.nic.in for user manual. In this round the provisional allotment of seats will be made to the CASE I Candidates on 23-05-2018 and will be placed in the website https://tspolycet.nic.in. For downloading the candidate’s provisional allotment order, enter the ROC Form Number, Hall Ticket Number, Password and Date of Birth in Candidate login in https://tspolycet.nic.in. If the candidate does not pay the prescribed Tuition Fee within the schedule mentioned, the provisional allotted seat automatically stands cancelled and he / she shall not have any claim on the Provisionally allotted seat. Further his / her candidature will not be considered for improvement round. 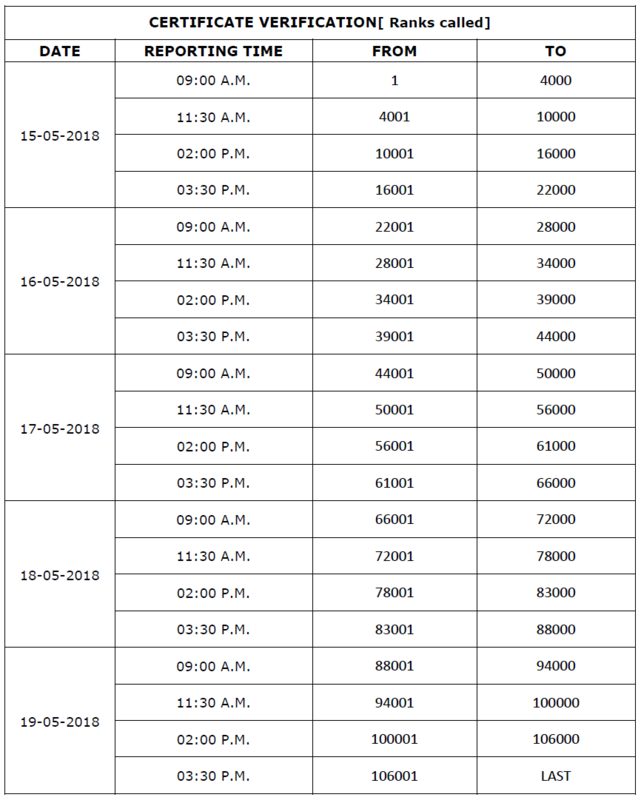 After payment of the Tuition Fee, if the candidate cancels the provisionally allotted seat through online on or before 27-05-2018, full Tuition Fee paid will be refunded. The provisional allotment of seats to CASE I and conditional provisional allotment to CASE II candidates will be placed in the website https://tspolycet.nic.in on 30-05-2018. 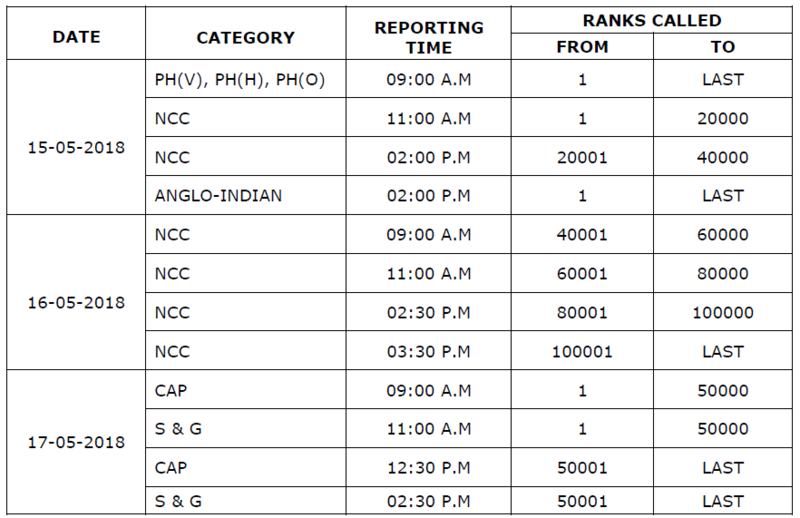 In candidate’s login, for all candidates after Self Report through online system, the admission number will be generated. Take the printout and report at the allotted college on or before 01-06-2018 and handover the relevant certificates. The candidate will forfeit 100% of Tuition Fee paid if he / she fails to report at the college by 02-06-2018 or cancels his / her admission after 02-06-2018. The CBSE /ICSE / NIOS /TOSS/APOSS/ SSC Advanced Supplementary -2018 appearing candidates who do not pass on declaration of the results, the Provisionally or conditionally allotted seat automatically stands cancelled and he / she shall not have any claim on the Provisionally or conditionally allotted seat. When was the final phase counsling.. please inform me. I'm case 1 candidate.. Can i self report on 30/05/2018. I paid my tuition fees before 27/05/2018.